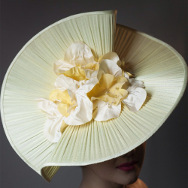 Workshop: The Lemon Souffle - a quintEssential Hat design! Made in the colours of your choice, the Lemon Souffle will extend your Jinsin skills. We will also make double-sided silk flowers, a flat-pattern Jinsin base, and our very special Sinamay-over-Petersham edge. This two day workshop offers four elements that can be used across your millinery repertoire. What you should bring: You will need 1.5 metres of Jinsin, two lots of silk dupion for the flowers, (different colours if you like) no more than half a metre of each. We supply: Wire, joiners, materials for proprietary edging and matching threads. We also supply all the tools you will need: dolly heads, wire cutters, pliers, sewing needles, thread, scissors, sewing machines, blocks, etc. Any of the workshop materials will be available for purchase should you need them. Let us know in advance if possible. More to learn about Jinsin and other millinery elements.